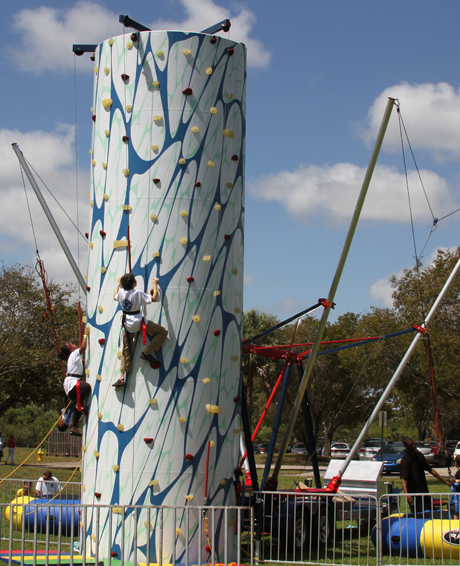 Build Your Own Adventure™ by adding our V2 Combo™ Bungee trailer to any of our climbing wall towers. 1-Piece aluminum poles are stored on the trailer and easily raised into the sky by a 12 volt hydraulic lift pump. Steel support arms latch around the poles and provide stability and support. There are no guy lines or turnbuckles to adjust, saving you time and frustration! If time is money, then the V2 Combo™ Bungee is sure to keep more in your pocket by saving on setup costs. The V2 Combo™ Bungee simplifies operation by utilizing our proprietary Jump Pump™. Pull out on the button and the hydraulic system automatically raises the bungee cords higher with each jump. When the jumper is ready to come down the operator simply hits the button to lower them. The Jump Pump™ runs on 110v power. Our V2 Combo™ Bungee is equipped with the very best components. Every harness, carabineer, bungee, pulley, and jump pod has been carefully selected to ensure that this is the ultimate jumping experience. Enjoy faster setup times, reduced staffing costs, and a safer jump with the V2 Combo™ Bungee!